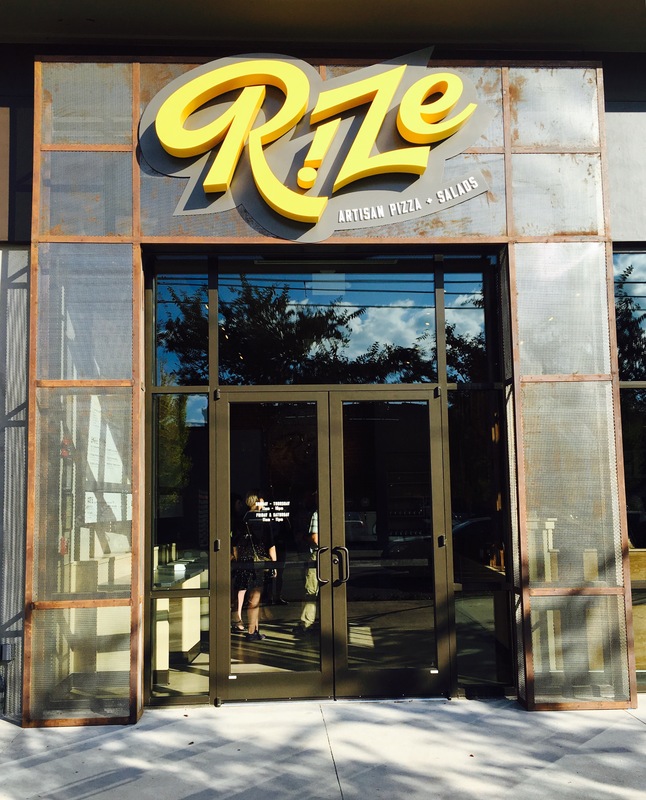 This Monday, Rize Artisan Pizza + Salads will officially open their doors for business in Atlanta. Yesterday, I had the opportunity to attend their Friends & Family Dinner for an exclusive preview of the menu. 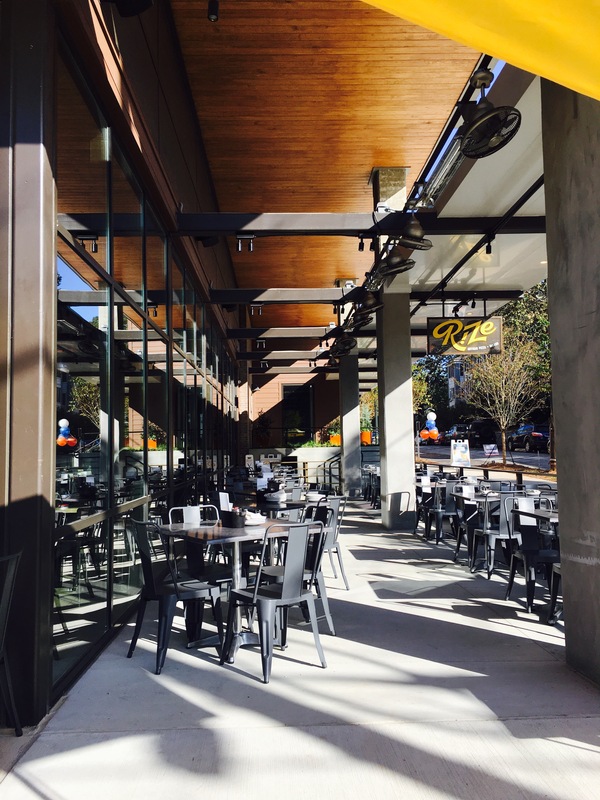 Located in the bustling Poncey-Highlands area, it immediately catches your eye with its huge outside eating area wrapping around it exterior. Inside, we were warmly greeted and received a full explanation of how their ordering system works. Once you order your food at the front, you get a tracking device. You take the device, equipped with Bluetooth, to your table. When your food is ready, the waiters can easy and efficiently find your table. 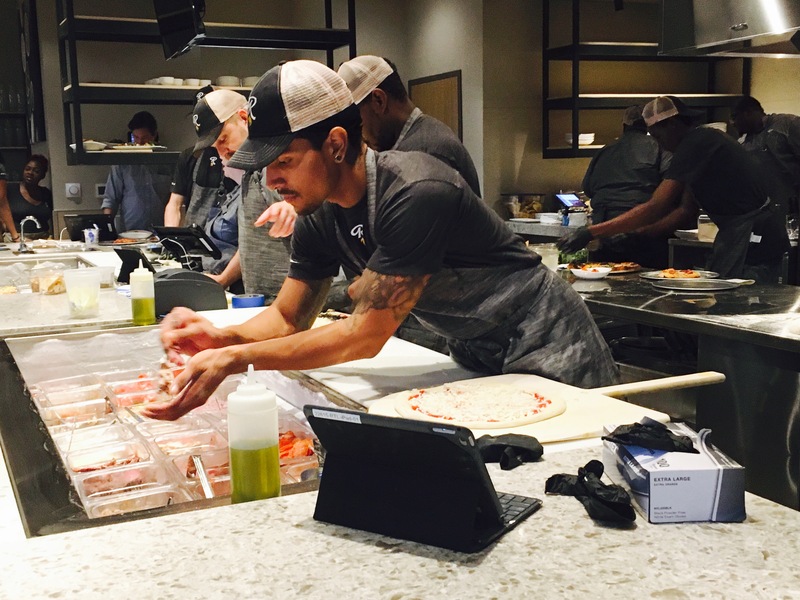 The interior offers several seating options including seats at the pizza making station for a front row seat to all the happenings in the open concept kitchen. 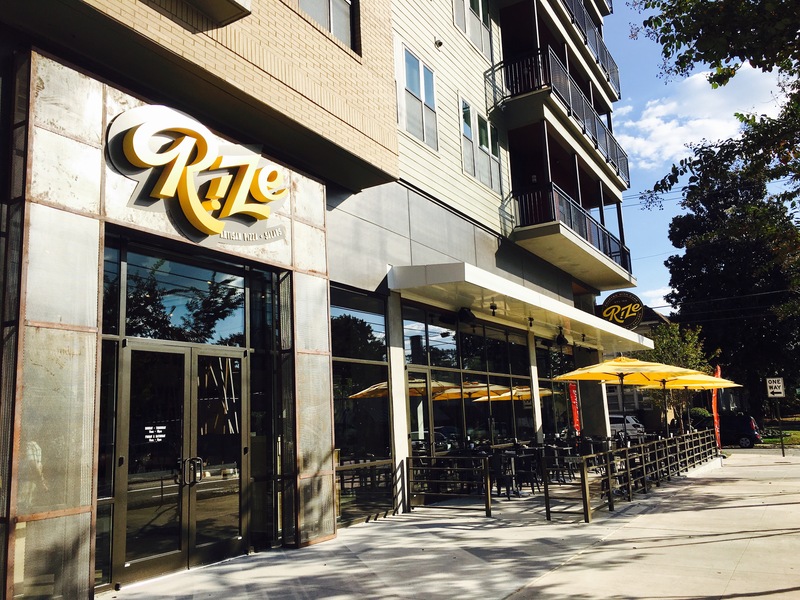 With large windows and open ceilings, Rize Artisan Pizza + Salads has an upscale industrial feel to it. Guest had a choice of several items off the menu. Everything sound absolutely amazing. We started with one of their Signature pizzas, the Wavery. It was topped with prosciutto, Gorgonzola, shredded mozzarella, Asiago, fig jam, balsamic reduction, and grana padano. Each pizza gets the seal of approval by a Certified Pizza Maker. Our delicious pizza was made by Nelson! 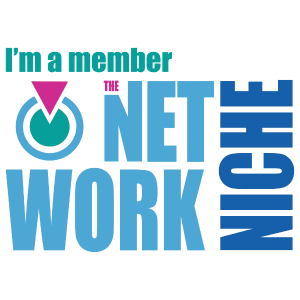 Thanks Nelson! 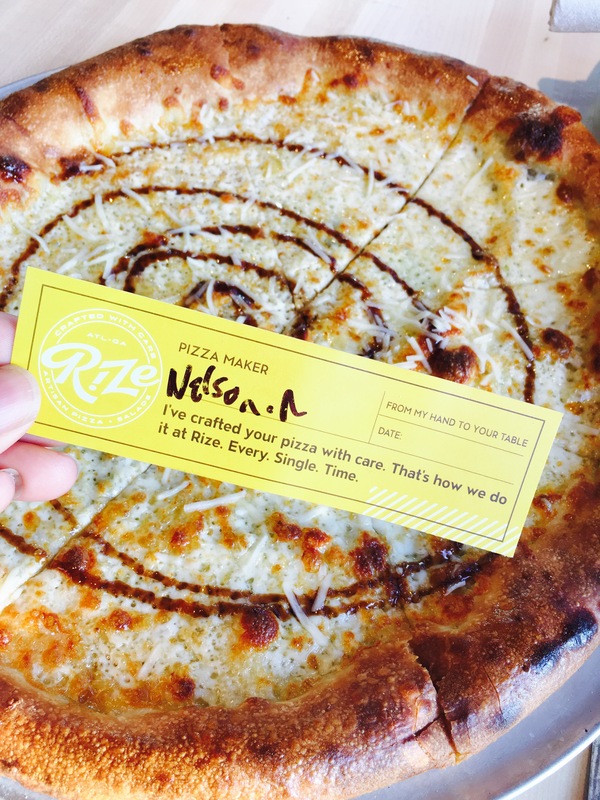 Rize Artisan Pizza + Salads uses a unique way of making their crust. Wanting a “crispy, yet airy, light yet sturdy” crust, they enlisted the help of dough experts to come up with this amazing crust. The dough is cold proofed for 48 hours, to allow for it to rise in a cool environment. Instead of tossing the dough, which takes all the air pockets out, the dough is gently opened my hand. With this method, air pockets are left intact. Next, the pizza is baked in a wood burning oven at 575 degrees for over 3 minutes. Once baked, the crust is drizzled with the extra virgin olive oil. The end result is a beautifully made pizza that is delicious in every way. Next we tried a few items off the Small Plates menu, the Old World Hummus and the Charbroiled Wings. 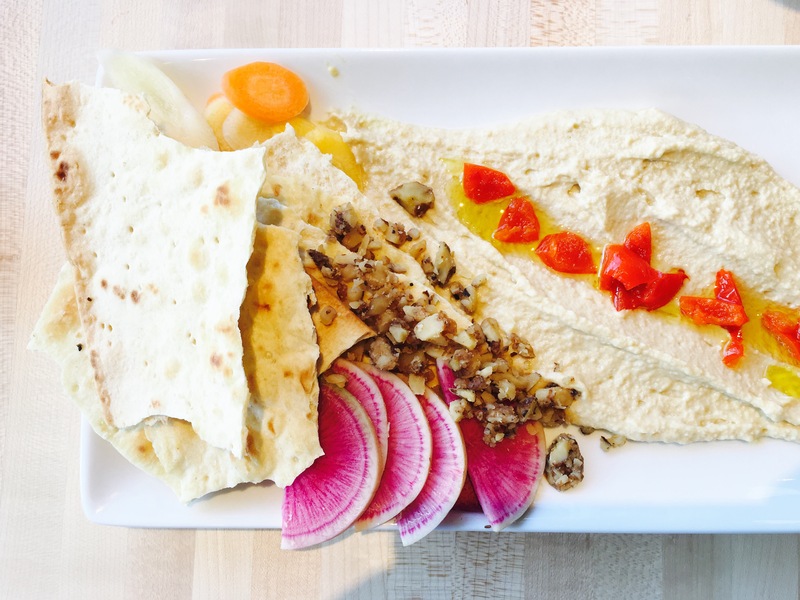 The hummus came with spiced walnuts, watermelon radish, tri-color carrots, peppadew peppers, olive oil, and lavash. I’ve had a lot of hummus in my lifetime and this one can be easily put in my top 5. The combination of all of the flavors just married really well together. The Charbroiled Wings were probably my favorite part of the dinner. They were so amazing! They start with 100% natural, Georgia raised chicken wings from Springer Mountain Farms. 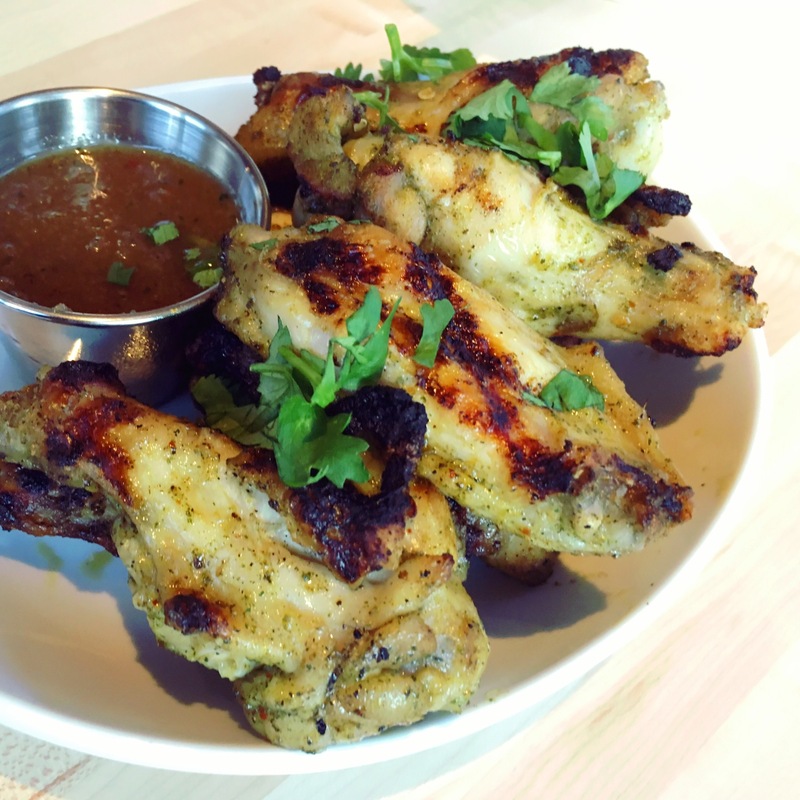 With a spiced herb rub and a ginger-honey sauce, these wings were just plain delicious! I’m definitely going back for these wings! Next up, the Roasted Shiitake Mushroom Pasta. Another favorite of mine. 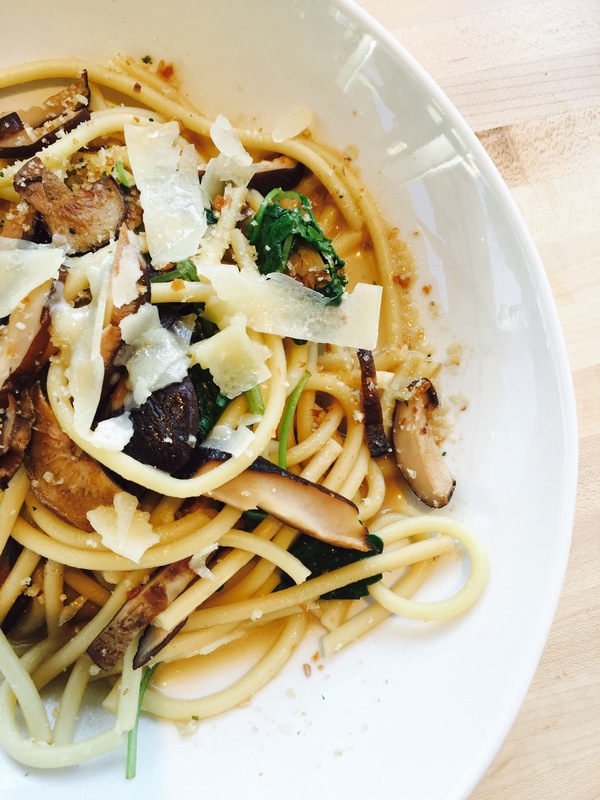 This pasta dish consisted of bucatini, roasted shiitake mushrooms, white wine, baby kale, herbed pecan breadcrumbs, and grana padano. Oh so good! 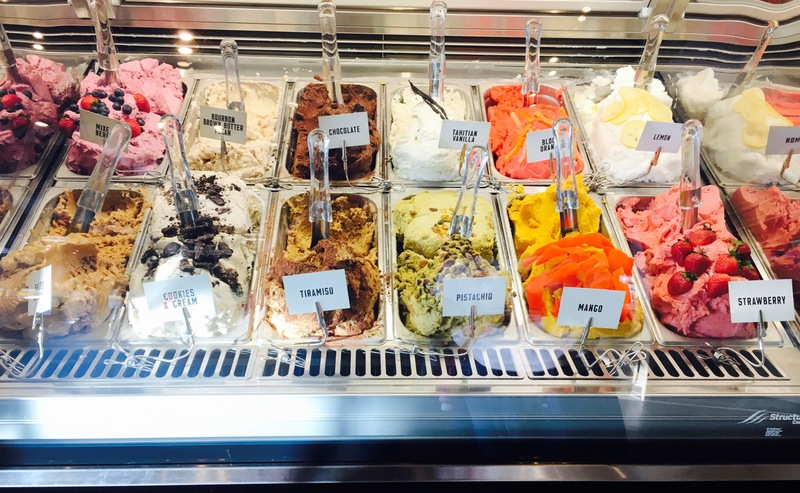 For desert, we visited the in-house gelato bar. After sampling almost all of the delicious flavors they had to offer, I went with a cup of Bourbon Brown Butter Pecan. Yesss! 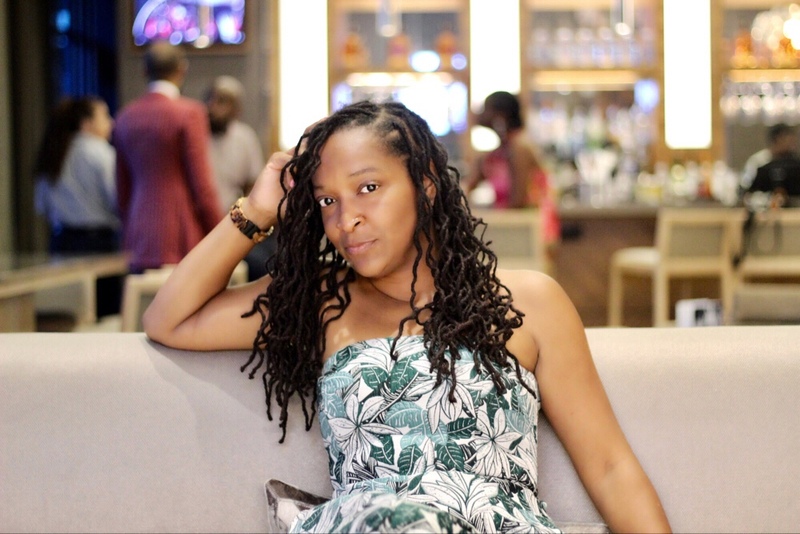 They kind of had me at Bourbon….and Butter Pecan. Two of my favorite things in one bowl makes for a great end to a most awesome meal at Rize Artisan Pizza and Salads. Be sure to stop by this Monday when they officially open their doors. I still need to try the rest of the menu, so you just might see me there!